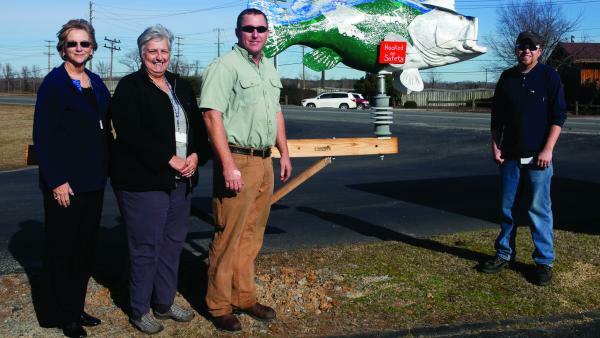 Dominion's Roanoke Valley Rock Fish committee members were: Michael K. Shearin, Distribution Construction Lineman; Johnathan P. Smith, Substation electrician; Sandy Craft, Coordinator Customer Relations and Audrey I. Hurst, Distribution Right of Way Agent III. Johnathan Smith spent many hours bringing the committee’s ideas to life on the fish. Dominion's construction group prepared and installed a “cross arm” mount to add “Sparky” to the “Roanoke Valley Rocks” initiative. Dominion was proud to join the other Rock Fish supporters in the Roanoke Valley Rocks initiative. Be sure to stop by and check out Sparky located at the entrance of the district office. Sparky displays the many hours we spend here at Dominion keeping the lights on. One side of Sparky shows our daylight hours and the other represents night time, as we work 24/7 to keep the lights on for our customers.